« I am a Naijapolitan! 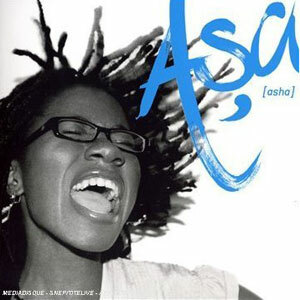 This entry was posted on March 9, 2008 at 2:20 am and is filed under CD Reviews with tags Naija Nigeria Asa Asha Music. You can follow any responses to this entry through the RSS 2.0 feed. You can leave a response, or trackback from your own site. I love Asa too! Her album is awesome, all the songs in it capture your attention from the first minute you hear them. Great Album, I agree, however my version is not called ‘The Captivator’, nor does it have most of the songs alluded to in your review (mine contains, in order, Jailer, 360, Bibanke, Subway, Fire…, Eye Adaba, No one knows, Awe, Peace, Beautiful, and Iba), and I am pretty certain it’s an original naija version. Where can I get this ‘Captivator’ version. Also, just FYI ‘Eye Adaba’ doesn’t mean Birds in the Sky, it means Dove. Cheers! Hey lola, I actually have two CD’s with different song listings and in some cases a totally different rendition of the same song. I sourced both of them from Naija (a friend picked them up for me at the Lagos airport). I think one is a Naija version and the other is the “international” version. The english version of “Eye Adaba” is actually called “Birds in the sky” on the Captivator CD. Hi, Gosshhhh Asa is the bomb…she has some kinda spell she casts out from her songs. I need your help, i actually went to the niteshift colliseum to relax on a saturday evening when the dj played a beautiful song and i instantly singled out Asa’s voice. I guess she featured in the guy’s song, God !!! I love this song but its not on her album and i dont know where i could get it from. The song goes somehow like this: “********am on fire******you are the reason why i sing this song*****” I dont know if anyone could help out with the name of the track, knowing the track name would definitely help my search. Thanks. I love asa but meeting her is my greatest problem. She is my dream love. Do you know her email address or her number? I love asa but meeting her is my greatest problem. She is my dream love. Do you know her email address or her number or where she leaves? Asa is special! The album is absolutely wonderful. asa is the bomb. i love her music coz i’m being captivated by it. I am saying this becoz i’m also the captivator. more greese 2 the captivator’s elbow.